Several months before the move from my house in Florida to California where I now live, I’d been wondering about the symbolic meaning of a black snake in my yard. It had been there since we moved in to the house, but mostly showed-up during times of transition in my husband’s and my life. In 2008, the year my husband died, Snaked presented itself by lying across the steps at both the front and back doors at different times, then, disappeared. It began showing up again before my move to California. 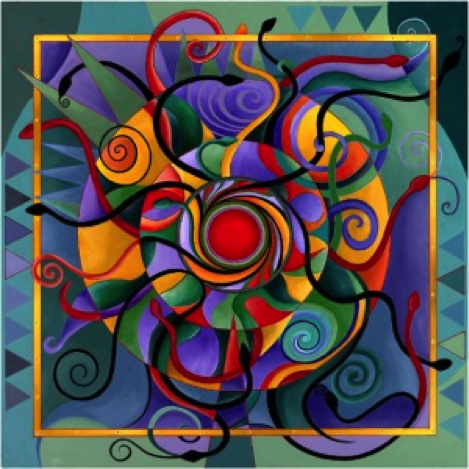 Four months before the move, I Felt drawn to a beautiful mandala that I’ve included here, titled “Serpentine Fire” by Jean Raffa. I copied it from Jean’s blog “Matrignosis” in the post titled “Dream Symbols of the Beloved,” June 12, 2010. Later in the same day I’d found the Serpentine mandala, I opened at random Alchemy of Nine Dimensions by Barbara Hand Clow and Gerry Clow to an Australian aboriginal painting of “The Cosmic Serpent.” Underneath the picture, the caption compares the serpents with double helixes and DNA. I was beginning to feel like there was an important message here for me in the DNA double helix! Perhaps, Jean Raffa would have more information for me. So, that afternoon, I commented on the “Dream Symbols of the Beloved” post and told Jeanie about the meaningful coincidences I’d experienced and had recorded in my synchronicity journal about Snake, the Clows’ passage, and the Medicine card I’d chosen, and how they all seemed to point to the double helix symbol and its meaning. Thank you for sharing your synchronicity, too, Jeanie. What fun! I bet there are others of your readers who have their own events of synchronicity to share around these discussions. It has been my experience that when an archetypal subject comes up in group, many in the conversation experience a synchronicity which highlights their own personal meaning(s) around it. By the way, do you mind if I share this exchange in my thesis/book, using your name and referencing your blog? If you would prefer that I do not, please don’t hesitate to say so. I always ask, before using anyone’s ideas or words. Jenna, Of course you may share this exchange and any others we may have in the future. I already know of at least one other synchronicity occurring around this same topic. A few days ago a Jungian friend sent me a dream featuring an elephant and asked for any thoughts I may have. I sent a few, then two days later picked up Aion and turned to the page I cited in my previous comment about the animals that represent the Self in dreams. The elephant was the first one mentioned. When I wrote that to her she responded that she had done a meditation and active imagination with her dream elephant and its message to her had been about how much it loved her. Nothing could point more strongly to the Self than that. Jean Raffa’s newest book, Healing the Sacred Divide: Making Peace with Ourselves, Each Other and the World, will be issued from Larson Publications in June of 2012.